Bill Kem has brought top quality gymnastics to Northern Oklahoma with a nationally recognized program. He is a member of the USA Gymnastics Federation, is an instructor and certified by their safety program as well as being a certified gymnastic coach. He was accepted into the prestigious Heart of America Gymnastic Conference which included the highest ranked coaches in the Midwest region and was twice voted coach of the year. 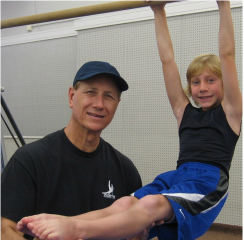 Bill has had extensive training from gymnastics “greats” and he has attended & instructed at the international C.O.C. Gymnastic Camps for several years. Bill holds an M.A. degree in Physical Education, Health and Recreation from Oklahoma State University (teacher certified), has taught at OSU and is a past president of the Oklahoma Coaches Association. Suzanne holds a B.A. in drama from Oklahoma State University, is a teacher certified, and has completed graduate work in Radio and Television. She formerly taught dance at Northern Oklahoma College and is co-owner of Inciardi Dance. She studied 20+ years with Phi Delta Lee Neal, national examiner for the Cecchetti Council (Italian Ballet). Suzanne’s professional background began with world tours throughout Europe, Southeast Asia, Greenland and Iceland where she was a solo dancer and choreographer. She has studied in New York & Boston, danced with the Santa Barbara Ballet Company and appeared on television. In college she was a solo dancer and choreographer for the Student Entertainers. Suzanne has written and directed 15 industrial plays for corporate sponsored events. She is a former certified gymnastic judge and taught dance and beam for the international C.O.C. Gymnastic Camps. Cara began her dance career at age three with her mother, Suzanne Kem, and her acting career at the Ponca Playhouse at age four. By age 13, Cara was working professionally. In high school Cara choreographed dance numbers that won at the national level, and musicals at NOC (paid position). She has a Music Theatre degree from the University of Central Oklahoma and danced with the Kaleidoscope Dance Company for four years (by audition). Cara performed in New York City for almost ten years and is a member of Actors Equity. Her first show in NYC was at the Lamb’s Theatre at 20 years of age. She toured nationally for two years in the original Broadway cast of Disney’s High School Musical. Her last Broadway tour (first national Broadway tour) was with Shrek: The Musical. She finished at the prestigious Pantages Theatre in Hollywood, California. Cara is Head Choreographer and conducts master classes; she is currently teaching Hip Hop and technical jazz for the Ponca Hi-Steppers. She is the Theatre Director at Cowley College (Kansas) where she teaches dance, choreographs and directs the Theater Program. Cara brings experience, excitement and professionalism to Inciardi Dance. LeiLani is originally from West Virginia where she was a high school varsity cheerleader. She attended college in Marietta, Ohio, majored in elementary education, and was a cheerleader. While in Marietta, LeiLani worked with local squads developing competition routines. After graduation she went to work for Will Power Tumbling and Gymnastics Center in Ohio. LeiLani and her husband Bobby, along with three daughters, now make their home in Ponca City. 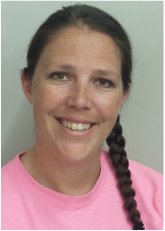 Her experience and proficiencies include: coaching elementary, middle school, recreational gymnastics and tumbling, and All-Star Cheer. Additionally, she was a level four gymnastics coach (beam, vault, floor exercise and uneven bars), a leader and coach for a preschool program, and Buddy and Me. LeiLani is a former office and gym manager. She is U.S.A.G. safety certified. Kat is originally from Claremore, Oklahoma and has studied dance since age eight. She was accepted into the first Tulsa Summer Arts program where she discovered the love of choreography, costume and production. She danced and assisted with choreography with the Northeastern State University (NSU, Tahlequah) traveling dance troupe before she transferred and graduated from the University of Tulsa. She continues to costume and assist with local community productions such as "Guys & Dolls" and most recently "Spitfire Grill" and "9 to 5: The Musical" at the Ponca Playhouse. Kat moved to Ponca City from Tulsa 13 years ago and since she was missing her Tulsa Tappers, Inciardi Dance was one of the first stops to see if an extra hoofer was needed. She hasn't looked back since. Currently employed with Ponca City Development Authority, she substitutes at the studio on a regular basis. Kevin began dancing with Inciardi Dance at the age of four and continued through high school. He graduated from the University of Central Oklahoma where he danced with the Kaleidoscope Dance Company and performed in music theatre for four years (by audition). In high school Kevin won national championships in tap and at thirteen won the regional tap contest (winning over adults and college dance majors) for the movie Tap. He was selected to go to NYC and open the movie with Gregory Hines. Kevin was the Diamond Denbo (out of 600 acts) and Super Kid (vocal, dance, instrumental and comedy) winner for American Kid Talent Search. He also was the Oklahoma Clogging Champion. As an adult Kevin worked in shows at theme parks including Disneyland, live theatre at Long Beach, CA and danced in Branson City Lights, in a 2,000 seat theatre in Branson. Kevin has been seen on television in CSI New York, Charmed, and a Fox sitcom. He has been in numerous commercials, both regional and national, as an actor and stuntman. Kevin enjoys being both in front of the camera and behind, and currently films and edits for production companies in Los Angeles.